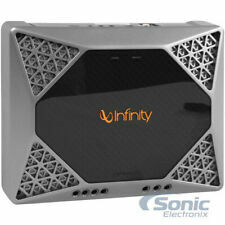 Up for sale is a used Infinity ONE mono block amplifier. 900rms at 2 ohms 500 rms at 4 ohms. 1800 watts max power. Condition is Used. All channels were tested and amp is fully working. Shipped with USPS Priority Mail. INFINITY REFERENCE SERIES 551A. This potent powerhouse will send up to 550 watts RMS to your subwoofer, and its Class D design ensures the amp's high output will put minimal strain your vehicle's electrical system. Infinity Kappa K1000. 1 x Infinity Kappa K1000 (New In Box). mono subwoofer amplifier. Amplifier Class: D. variable low-pass filter (32-320 Hz, 12 dB/octave). Dynamic Bass Optimizer uses variable bass boost (0-12 dB at 45 Hz) and subsonic filter (10-80 Hz, 12 dB/octave). Infinity Primus 3000a. 600 Watts Max, Monoblock Class D Subwoofer Amplifier. 1 ohm: Not Stable. Class-D Full Range 2-Ohm Stable Monoblock Amplifier. CEA-2006 Compliant Amplifier. 3-way protection circuitry (thermal, overload, and speaker short protection). Each model in the lineup will accept both high-level or low-level inputs, allowing these Kappa amplifiers to be added to virtually any car audio system, including factory installed systems. The Kappa series amplifiers give you the power to shape your car audio experience in new ways. Infinity Kappa Car Amplifier. 380 watts RMS x 1 at 4 ohms (600 watts RMS x 1 at 2 ohms). Mono Subwoofer. variable low-pass filter (32-320 Hz, 12 dB/octave). Dynamic Bass Optimizer uses variable bass boost (0-12 dB at 45 Hz) and subsonic filter (10-80 Hz). Infinity Kappa Car Amplifier. 700 watts RMS x 1 at 4 ohms (1,000 watts RMS x 1 at 2 ohms). Mono Subwoofer. Dynamic Bass Optimizer uses variable bass boost (0-12 dB at 45 Hz) and subsonic filter (10-80 Hz, 12 dB/octave). 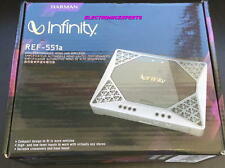 The Infinity Reference 551A is a 1 channel amplifier that is capable of putting out up to 550 watts RMS. The 551A is a great choice when looking to power a subwoofer. Infinity Reference 551A. 550 Watts RMS Reference Series 1-Channel Car Amp. Infinity Reference 551A. 1300W Max (550W RMS) Reference Series Class-D Monoblock 2 Ohm Stable Amplifier with High Level Input Adapters Included. Infinity Reference Series REF-551A Monoblock Amplifier. Model : Kappa K1000. Class-D Monoblock Amplifier. Each model in the lineup will accept both high-level or low-level inputs, allowing the JBL Stadium amplifiers to be added to virtually any car audio system, including factory installed systems. This potent powerhouse will send up to 550 watts RMS to your subwoofer, and its Class D design ensures the amp's high output will put minimal strain your vehicle's electrical system. Peak Power Handling : 1300W. We will send you a response within 24 hours, usually sooner! Choose your preference during checkout. Item Specifics. preamp and speaker-level inputs. Dynamic Bass Optimizer. 380 watts RMS x 1 at 4 ohms. Mono subwoofer amplifier.  mono subwoofer car amplifier. Mono amplifier with two 30A fuses installed.  Amplifier Quick-Start Guide.  Infinity window decal. variable low-pass filter (32-320 Hz @ 12 dB/octave). 116 watts RMS x 1 at 4 ohms (312 watts RMS x 1 at 2 ohms). Mono subwoofer amplifier. mono subwoofer car amplifier. Mono amplifier with one 30A fuse installed.  Amplifier Quick-Start Guide.  Infinity window decal. Max Power: 1300W Peak. ANL fuse holder with 100 amp fuse. Infinity Reference car amplifiers are designed with a compact chassis and small footprint to ease installation, even if available space is limited. 1300W Peak (550W RMS) Reference Series Monoblock Amplifier Infinity REF-551A Amplifier 1300W Peak (550W RMS) Reference Series Monoblock Amplifier. 370 Watts RMS x 1 @ 4 ohms. 550 Watts RMS x 1 @ 2 ohms. Might work perfectly, might not. I have no idea. High tech and stylish Infinity's Kappa K600 mono subwoofer amplifier supplies your subwoofer with up to 600 watts RMS - good newsfor all you bass fans out there. The space age-looking brushed aluminum chassis features dancing, signal-level LEDs which add to the amp's high-tech look and overall coolness factor. This potent powerhouse will send up to 550 watts RMS to your subwoofer, and its Class D design ensures the amp's high output will put minimal strain your vehicle's electrical system. 370 watts RMS x 1 at 4 ohms (550 watts RMS x 1 at 2 ohms). Infinity K600 Kappa Series Amplifier 1500W Peak (600W RMS) High Performance Kappa Series Class-D Monoblock 2-Ohm Stable Car Subwoofer Amplifier [NEW]. Item model number: K600. 1500W Peak (600W RMS) High Performance Kappa Series Class-D Monoblock 2-Ohm Stable Car Subwoofer Amplifier. 1300W Peak (550W RMS) Reference Series Monoblock Amplifier. 370 Watts RMS x 1 @ 4 ohms. 550 Watts RMS x 1 @ 2 ohms. Total Peak Power: 1300 Watts. Item model number: 4333160092.